In Toxic People ®: WHO IS TOXIC SPECIFICALLY YOU? Discovering Why Certain People Push Your Buttons and Make Your Life Miserable, part of her as TOXIC PEOPLE ® Audiotape series, Dr. Glass helps you identify those who are specifically toxic to YOU. Just because someone may be toxic to someone else, it does not necessarily mean they will be toxic to you and vice versa. You will discover exactly who has been toxic in your past and present so that you don’t have to repeat it in the future. Knowing this will give you the heads up as to how to handle these type of people who may happen wind up in your life in the future. In Toxic People ®: WHO IS SPECIFICALLY TOXIC YOU? 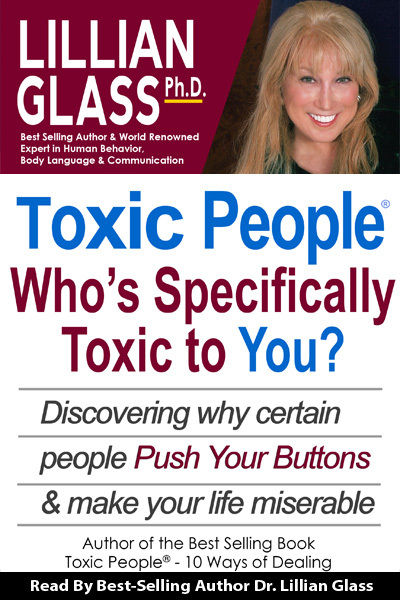 Discovering Why Certain People Push Your Buttons and Make Your Life Miserable, part of her TOXIC PEOPLE® Audiotape series, Dr. Glass helps you identify those who are specifically toxic to YOU. Just because someone may be toxic to someone else, it does not necessarily mean they will be toxic to you and vice versa. You will discover exactly who has been toxic in your past and present so that you don’t have to repeat it in the future. Knowing this will give you the heads up as to how to handle these type of people who may happen wind up in your life in the future. Read by Dr. Lillian Glass, world renown communication expert, Dr. Glass is the is the original author of the best-selling book since 1995 Toxic People. Through the popularity of this book she coined the phrase “toxic people” used in today’s vernacular. If you have ever wondered why you may be attracting the same type of Toxic People over and over in your life, now you will know why. Now you can be on the lookout for these specifically types of people so that you don’t invite them into your life, causing you emotional and physical distress.